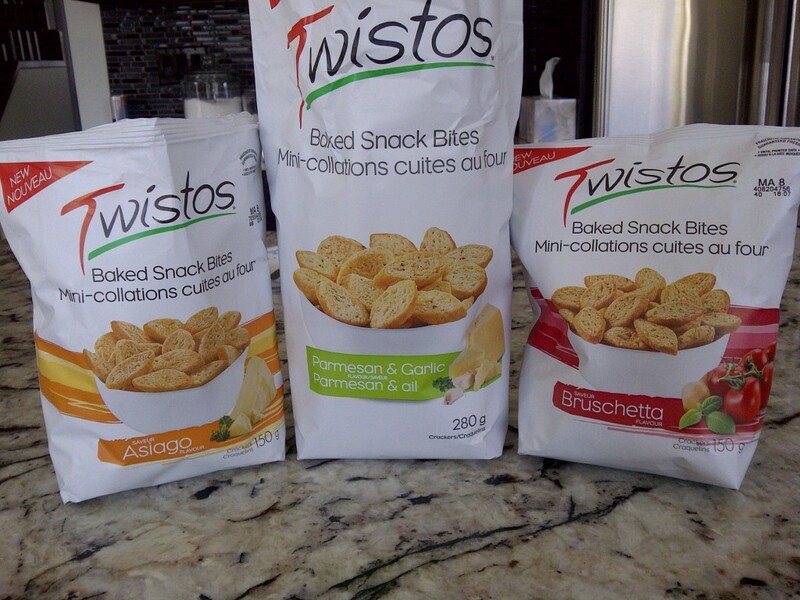 I must take a moment out of my busy day to rave about the new Twistos snack bites. It all started when I bought my first box in December from Costco. 3 boxes (that’s 2 X 280g per box, because of course Costco never sells in regular people quantities) later and I’m still hooked on these crispy bite sized snacks. A product from the Frito Lay company, these miniature sliced baguette looking crackers are as crispy as they are tasty. The Parmesan & Garlic flavored ones, the flavor that originally reeled me in, have a strong garlic taste which I love. I’m a huge fan of garlic and parmesan, and as the package states, they are “seasoned so that they are irresistibly delicious right out of the bag”, these is no holding out of either flavor. The bag does not lie. There is no dip or spread required. I first served these at a family Christmas dinner, with a 3 onion dip, and noticed that at the end of the night all the Twistos were gone and the dip barely had a dent in it. The garlic after taste may seem a little strong for those who don’t fancy garlic. But for those are a fan, you won’t be able to stop after one piece. Twistos can now be spotted at grocery stores such as Walmart and Superstore, with other flavors including Asiago and Bruschetta, which Costco did not have displayed. The Asiago flavor has strong hints of cheese flavor, and would probably entice those with anti-garlic taste buds. Very similar in taste sans the garlic, the two flavors, Asiago and Parmesan & Garlic, are slightly difficult to separate and distinguish. The Bruschetta flavor however, surprisingly tastes like Bruschetta! There is a lovely basil flavor along with a tiny pang of sweet tomato. A pretty impressive attempt to capture all the flavors of Bruschetta in a small cracker. A nutritionist I am not, but I do know that for per every 17 crackers there is 120-130mg of salt (depending on the flavor), which definitely won’t damage your diet too badly. A label on the package advertises that Twistos are made with all natural flavors, although the last ingredient on the list just says “colour”, and I also noticed corn maltodextrin as one of the seasoning ingredients. But really, in the end, that doesn’t bother me enough to ask questions. Bottom line is, these are some of the best snacks I’ve tasted in a while. Much more exciting that a plain ol’ cracker, and also offers the same amount of crisp and crunch as a chip. Try them, I hope you will find them as addicting as I do!